Sandwiched between The Mechanic (1972) and Death Wish (1974), The Stone Killer is the least of the three. 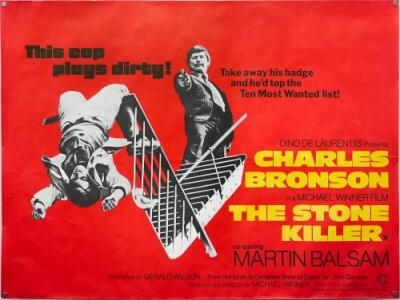 Each was directed by Michael Winner and starred Charles Bronson, but where The Mechanic was intelligent and surprising, and Death Wish, maybe the most misinterpreted masterpiece of ‘70s cinema, was downright startling and challenging, The Stone Killer, is a rather muddled cop thriller with no clear aim, despite some interesting concepts, an excellent cast, and a slam-bang climax. The film was based on a Derek Torry novel, A Complete State of Death (1969), written by John Gardner, later Ian Fleming's successor as official James Bond novelist, about a Scotland Yard inspector of Italian descent. The Stone Killer moves the setting to America, shuttling between New York and Los Angeles, but seems to have been influenced more by the success of Dirty Harry (1971). The end results aren't bad, just routine and, given Bronson's routinely fascinating output during this period, roughly 1968-74, a bit disappointing. The title, incidentally, doesn't refer to Bronson's character, but rather is a (alleged) Mafia term for a hitman hired outside the family's inner-circle. Bronson is Lou Torrey, a New York police detective in hot water after shooting an armed 17-year-old in Spanish Harlem. Torrey leaves the force to accept a lieutenant's position at the Pico Branch of the LAPD. Almost at once he's back in New York, delivering a one-time Mafia hitman, Armitage (Eddie Firestone), now a pathetic heroin addict. However, he's gunned down at JFK Airport, just after unsuccessfully trying to broker a plea with Torrey. Armitage claimed to have information about an impending assassination plot. Torrey sees an obvious connection between Armitage's murder and the similar murder of a convict (David Moody) in Los Angeles. The screenplay by Gerald Wilson (Chato's Land, Lawman) is full of intrigue but not much clarity. The movie cuts back-and-forth between Torrey's investigation, which never makes much progress until the very end, and the machinations of Sicilian-American Mafia don Al Vescari (Martin Balsam). For the last 42 years (!) he's been plotting to avenge the mass murder of Sicilian gangsters in a single April day in 1931 with a similar assassination against the descendants of the mob bosses that took over. To achieve this he's had his lieutenant (Alfred Ryder) hire an elite group of "Stone Killers," non-Sicilian ex-Army mercenaries led by Mr. Lawrence (Stuart Margolin). In the movie Lawrence's men are seen training for the hit in California's Mohave Desert, including an interesting hideout location, apparently a real-life mansion extending out from a mountainside. Wilson's script teases the intrigue a little too long, leaving the movie audience impatient and armed with too little information to stay interested. Further, much of the story hinges on the somewhat distasteful premise that combat-experienced Vietnam veterans make great hit men. The script seems to imply such veterans return home so unhinged by their experiences they're of little use except as cold-blooded killers for hire. The Stone Killer was made in the wake of Dirty Harry, and its archetypal fascist cop, an antihero thumbing his nose at laws designed to protect the accused, with Harry Callahan a one-man judge, jury, and executioner. Torrey is not so clearly defined. For one thing, like Harry Callahan, he takes the law into his own hands but, quite unlike Eastwood's character, it's always because he conveniently has no other options available. The 17-year-old was an active threat to everyone around him. Torrey mows down another killer with his car because the gunman was empting his revolver into Torrey's windshield. Unlike the Dirty Harry movies, the NYC and LA police don't seem too rattled by Torrey's penchant for causing mayhem, even when in an elaborate car-motorcycle chase he inflicts tens of thousands of dollars in damage to various vehicles, buildings, and most of a street fair, endangering half of Los Angeles in the process. The movie attempts to contrast Torrey's experienced, methodical police detective with a racist colleague (Ralph Waite, who seemed to specialize in such parts before joining The Waltons). On the other hand, Torrey isn't above beating a suspect in police custody, nor shooting-first, asking questions-later generally. It's too bad The Stone Killer's script isn't up to its polish in most other areas. The music score by Roy Budd is memorable and the fine cast includes Norman Fell and John Ritter as cops, Paul Koslo as a convincingly psychotic gay hitman, Walter Burke as an informant, Charles Tyner cast against type as a doctor, Robert Emhardt as a talkative "John" at a motel, etc. A Columbia release licensed by Twilight Time, The Stone Killer looks good in its 1.85:1 high-def presentation. The cinematography is inconsistent but uses the gritty New York and Los Angeles locations well, and the 2.0 DTS-HD Master Audio mono audio is fine. The all-region disc, limited to a 3,000-unit pressing, includes optional English subtitles. Supplements include the usual isolated music track and liner notes by Julie Kirgo, an audio commentary by Bronson biographer Paul Talbot, and a trailer. Fair to middling, The Stone Killer falls squarely in the middle of Charles Bronson's filmography, neither particularly good nor particularly bad, just average, and mildly disappointing considering it was made during a period when Bronson's best starring film work was far more intriguing than rival Clint Eastwood's. Still, mildly Recommended.